One of the happy outcomes of the cable television revolution was that more stations were competing to brand themselves with audiences, and one method some of them chose was to start making their own films. The budgets were not as large as what Hollywood might provide, but the results were often more original. 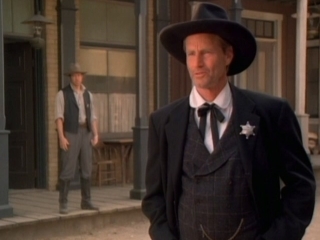 Such is the case with Uli Edelâ€™s unconventional western Purgatory, which debuted in 1999 on Turner Network Television and has attracted a growing base of fans ever since. 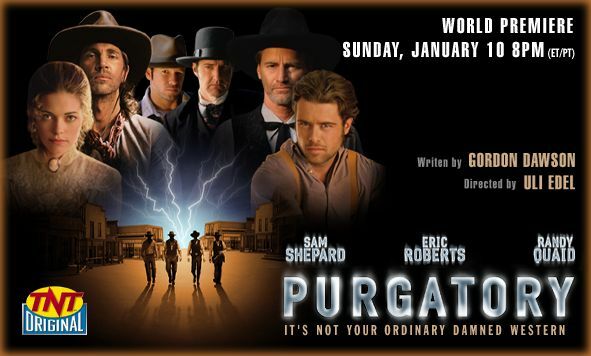 Purgatory opens as a classic oater, with glorious vistas, exciting gunfights, noble sheriffs and vicious outlaws. But then the film takes an entirely novel, Twilight Zone-eque turn as a group of bank robbers gets lost in a sandstorm and arrives in the strangely peaceful town of Refuge, where a sheriff who doesnâ€™t even carry a gun (Sam Shepard) unhesitatingly welcomes them to stay. The town has a saloon that no one enters, a church that every single resident attends every day, and some strangely familiar-looking locals, all of whom are watched over by a wizened Native American medicine man. I am not going to tell you more than that for two reasons. First, I donâ€™t want to spoil this fine film for you and second, I need the space this week for an RBC first: An interview with the star of a recommended film. Brad Rowe is the emotional center of the film as â€œSonnyâ€ the one member of the pack of snarling bad guys who is a decent, vulnerable human being to whom the audience can relate. Brad has since gone on to become an expert in drug and crime policy, working with Mark Kleimanâ€™s BOTEC consulting firm. I am grateful for him for taking the time to talk about Purgatory. Brad, youâ€™ve been in many movies and television shows, but say that this film was probably the most fun you ever had as an actor. What was so enjoyable about it? First of all I was a very young actor and had hardly been around the block. Uli Edel was kind enough to have me come in to read for one of the lead roles in a project that already had Sam Shepard, Eric Roberts and Randy Quaid attached. After getting the role, when I arrived for the cast read through, my eyes were as big as saucers. These guys were legends to me and it was really endearing that they all took me under their collective wing. And then we got to the work of training, which included riding professional stunt horses, learning how to quick draw guns, staging screen fist fights and perfecting our cowboy swagger in period clothes. Lots of down time too where the other actors and crew would share fun stories about the countless projects and people they had experienced over the decades. I was in heaven. There was something magical to the story telling as well. Gordon Dawson had written a solid screenplay and TNT was really invested in making that story come to life. I think we all knew we were working on something special. As it turned out the project was well produced and promoted, so it found an audience. It wasnâ€™t until I had been around for a while that I truly appreciated how many wonderful professionals had come together for a few months to make some movie magic. And of course the genre of the Western has become more of a scarcity recently so that time holds a bit of additional nostalgia for me. I could imagine an actor first reading Dawsonâ€™s script and thinking â€œThis strange plot may just not work for an audience expecting a traditional westernâ€. Did you have that worry or did the story hook you right away? I personally didnâ€™t have any reservations. It felt like the super-western with a cast of characters that spanned the storied history of the wild west. The supernatural twist was an essential tool for exposing everyone in the storyâ€™s true character â€“ warts and all in some cases. What resonated for me was how close that character was to me at that point in my life. I was new to Hollywood and eager to learn and in many cases found myself swimming with sharks. Sonny was doing his best throughout the story to stay true to his values but finding mentors who shared the same compass was nearly impossible. Do you think of Purgatory as a religious film? I do. There are both themes of spiritual redemption and rigid religious observance. Churchgoing is a central to community life in Refuge and it is the place where individuals who have lived characteristically sinful lives get a shot at redemption through faithful observance of a very strict protocol. It is the adherence to that difficult path that causes the biggest challenge for several of the main characters. Forgiveness, selflessness, and sacrifice all play heavy in the story as well. I donâ€™t want to make the movie seem overtly fire and brimstone but it hits the audience pretty squarely. Thankfully Purgatory is the uplifting kind of spiritual journey though. â€œLarger than lifeâ€ is an overused phrase, but it applies to the playwright-actor-director Sam Shepard. What is he like in person? He was tremendous. We hit it off very well from the get go. I had read several of his plays and even put up some scenes from â€œBuried Childâ€ and â€œTrue Westâ€. He has an extraordinary, though often very dark, voice as a theater writer. It was great to see that he knew he was pushing the envelope in those plays and he had a good laugh at people who took him too seriously. It also helped that he had a son my age and was living in the Midwest at the time, so we had lots to talk about â€“ fishing and things like that. He also taught me that in order to be a powerful actor on camera, you needed to have a strong internal life that was private, that you could keep to yourself. And that the more still and simple your choices were on screen the more it allowed the audience to connect to you in a real way. Those were really big lessons for me. The climactic shoot out in Purgatory was extraordinarily complex, and itâ€™s amazing that all the action can be followed on the small-screen rather than being a confusing, chaotic mess. How long did it take to shoot that sequence, and what challenges did the cast and crew encounter in the choreography and camera set-ups? 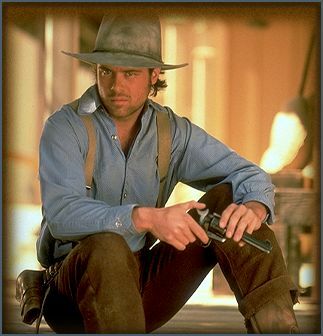 This movie requires you to play cowboy, ride horses, shoot pistols and kiss Amelia Henle. A lot of men would not have been willing to make these kinds of noble sacrifices for the sake of artâ€¦where do you find the strength to do so? You know Keith, it comes from a very selfless place. Completely in service of my fellow man. If it were not me making those sacrifices for the greater good, then who? That is what I ask. Then who? I think you have left all of us feeling inspired to be better people. Thanks for talking with me Brad and congratulations on a first-rate movie.